Internet sites are already popping up on the Internet calling for the impeachment of President-elect Barack Obama. President-elect Barack Obama won't be inaugurated for another ten weeks, but groups are already forming on the Internet to call for his impeachment. Several groups exist on the social networking site Facebook, calling for the removal of Obama from office for a number of reasons, including planning to not uphold the Constitution of the United States and campaign finance violations. "This group has been created under the assumption that it takes approximately 7 seconds for a modern day President to violate this oath. So we should be ready." Impeach Barack Hussein Obama seems mostly concerned with the Democrat's prior support for an assault weapons ban and accusations that he's a closet Marxist. "Obama has voiced support for various unconstitutional programs such as the assault weapons ban, universal healthcare, and various schemes for wealth distribution. What are we going to do about it? RESIST SOCIALISM! IMPEACH HIM! might as well start before he gets in office." The Agence-France Presse notes that there are currently many more groups calling for the impeachment of current President George W. Bush, but the president's had eight years to generate a lot of fodder for critics. 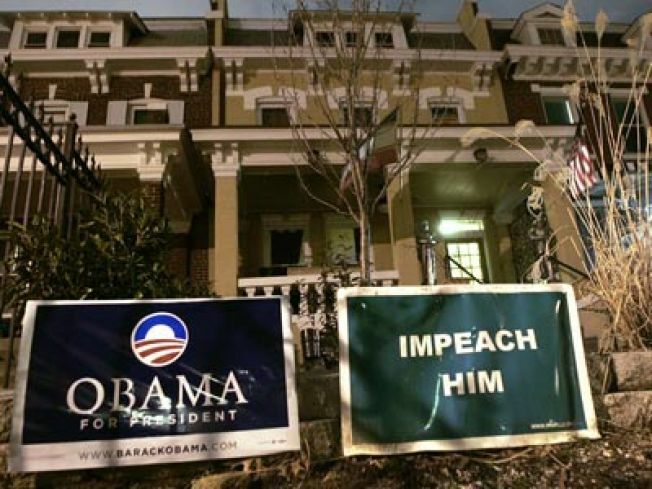 Few of those groups seem to have gathered the level of support that Obama impeachment groups have already attracted.